Champs Elysees Avenue (Paris), named after the ‘Elysian Fields’ where happy souls live in the hereafter according to Greek myth, runs through Paris for 2-km (1¼ mile) from the Place de la Concorde until the Arc de Triumph. While walking in Paris, In Champs Elysees Avenue, the city stands for the style and happiness of living in France, and on top of the massive traffic and fast food restaurants, the Avenue des Champs Elysees still sparkles. Along the way, you will see fancy brands such as Louis Vitton and Cartier but also cinemas and cafés. In some magical way, the avenue always feels like there is something happening in this avenue – the stores are open up until late in the evening and many are open even on Sunday, something which is not a common practice in Paris and certainly not in France. 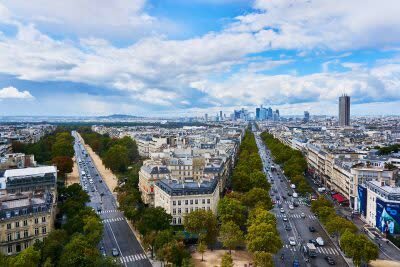 The Champs Elysees Avenue (Paris) is unarguably one of the famous streets in the world and is also considered by real estate experts to be one of the most expensive real estate streets in Europe. The avenue is also where the last part of the Tour de France bicycle race starts (this happens in late July, check out their web site for exact date each year). Also the parades on Bastille Day (July 14) and Armistice Day (November 11) take place in this fancy street. Walking in the Champs Elysees Avenue, Paris looks shiny, luxurious, hhis is once spot you want to be if you’re looking for some great shopping. Be sure to get a glimpse of Champs Elysees by night with Seine River Cruise, Paris Illuminations and Dinner on the Champs-Elysees.